The lure of management as a career path is strong. After all, it's good to be the boss. Or, is it? In typical organizations, managerial positions range from front-line supervisory positions to the top manager in the firm, the CEO. In-between, there are managers of managers, general managers, product and project managers (focused on initiatives and offerings) and a variety of other roles that regardless of the title are still management positions. Front-line supervisory roles are entry-level management positions. The supervisor is typically responsible for guiding a team of people responsible for a particular part of the firm's operations. This role is predominantly focused on ensuring the work is completed in alignment with company standards and targets. The supervisor provides day-to-day guidance to her team and is involved in training, coaching, disciplining and hiring/firing activities. The supervisor reports to someone in a managerial role overseeing one or more supervisors and functions. A functional manager is responsible for a broader range of people, process and business activities. He might have a number of supervisors or first-level managers reporting to him, and in addition to overseeing the work of those individuals and their teams, the functional manager is accountable to his boss for achieving goals and targets around productivity, quality, cost and sometimes revenue. This individual splits his time between operations and people-related issues and business reporting and planning activities. Senior managers and directors are typically responsible for a number of groups and departments, and they invest a great deal of their time supporting the development and translation of strategies and goals into programs and actions. They are directly accountable to senior executives, often reporting to a person with a vice-president title. Vice presidents are often the highest ranking individual in a particular function. From sales to marketing, to I.T. to finance and engineering, most firms identify the functional leader as a vice-president reporting to someone with a "C-level' title. These individuals are functional experts charged with working with other senior executives to form and implement strategy and then to ensure that their functional resources are aligned around the right initiatives and activities. A general manager is accountable for all resources and results for a line of business in the company. The general manager is a mini-CEO, responsible for strategy, structure, talent, key decisions and operating results including revenues and costs. 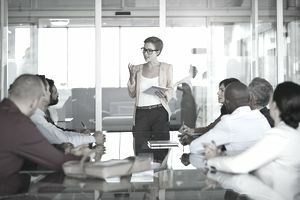 The general manager is accountable to a corporate group, often the CEO, and her time is spent predominantly on overseeing large strategic initiatives, facilitating key decisions and coaching and developing direct functional managerial reports. Product managers are focused on one or more offerings (products or services) and are charged with working across the organization to bring new products to life and manage the marketing decisions around features, pricing, packaging, and promotion for their offerings. There are managers of product managers, however, this role is primarily offering and not people focused. Product managers work with all areas of the organization and must be outstanding communicators. Project managers are responsible for all of the work we do once in the form of projects in our organizations. In this difficult role, the individual is responsible for bringing together a team of individuals to create something new. Once the initiative is completed, the project manager focuses on a new initiative and a new team. Typically, project managers do not have direct managerial oversight of people although they spend their days working with, coaching, helping and developing people. Guiding the work of the team in pursuit of key goals and objectives. Participating in the creation of strategies and goals. Managing costs and budgets, and for sales management roles, driving profitable revenues. Fostering a positive working environment for all participants. Developing reports, monitoring KPIs and sharing outcomes and actions. Working across functions in pursuit of new initiatives or problem-solving activities. Communicating and sharing new targets, programs, ideas, and results. Supporting team members as they navigate challenging issues. Interacting with customers or customer-facing team members to better understand how to meet customer needs. As an engineer, I can help the company with my contributions. As a manager of engineers, I can help the company in a much larger way by supporting and developing a whole team of great engineers. You have the ability to amplify your own ideas on strategy, direction and problem-solving through others. You gain the reward that comes from developing great professionals over time. You become involved in defining how the business improves and changes over time. You develop your own skills for leading and coaching. You have some autonomy over your own priorities, although less than you might imagine. Adding managerial responsibilities to your job function will result in increased compensation. However, many firms also offer compensation growth options for their valued individual contributors, so moving to management is not the only way to grow your income. You are immersed in working with people of all levels, backgrounds and experience sets: this can be exhilarating. Many managers, particularly those closer to the customer or front-line employees are involved in constant problem-solving and troubleshooting, which can be rewarding and certainly make the days fly by. As you grow as a manager, more of your work shifts to guiding others instead of doing the actual tasks. You grow your skills and diversify your experience by moving into management. Yes, there are certainly many good reasons to consider a career in management. However, there are some downsides as well. Your time is not your own. Most work days will be an endless barrage of issues and encounters, most of them focusing on problems. You will do less work and spend most of your time talking. If you love your daily work, be prepared to give much of it up in favor of working with and guiding others. The higher you rise through the ranks, the less your technical skills matter and the more the soft skills of leading, coaching, and critical thinking apply. You will have less autonomy in decisions than you might imagine. Every manager reports to someone and depending on the style of your own boss, you will invest a good deal of time seeking approval to make changes you know are essential to improving results. You will be caught between the needs of upper management for numbers and results and the realities your team faces including resource shortages, equipment needs and lack of broader organizational support. This can be an uncomfortable position. You may find yourself without the time in your schedule to focus on coaching and developing employees. Problems become larger and more difficult to solve the higher you rise through the ranks. Most decision-choices at lower levels are based on policy and relatively easy yes/no issues. As you move up the ranks, the decision issues are more ambiguous and the risks larger from getting them wrong. Your peers in other functions are your potential competitors for future promotions. Managing others: being responsible for the work of others is hard work. As one wise manager once said, "this would be easy if it weren't for the employees." Your ability to grow in your career is dependent upon others choosing you to be successful. As an individual contributor, your technical or functional skills/knowledge correlated to your success. As a manager, the choices are more political in nature and the competition fierce. While it is nice to believe someone will look out for your professional development, more often than not, it's up to you to make certain you keep your skills fresh. Volunteer to lead initiatives or project teams to gain experience being responsible for the work of others. Work with your manager to identify a set of increasingly difficult management-type tasks. Seek out input and guidance from experienced managers in your firm. As a mentor about the challenges and rewards that accrue from a role as manager. Read widely on the topic. Armed with either experience or additional context, you are better able to make an informed decision on this important career step. The burnout rate for first-time managers is extraordinarily high. Instead of ending up on the wrong side of this statistic, take the time to learn more about the role and then make a careful choice. If you opt to go the management route, seek training early in your tenure and hold yourself accountable for developing the soft skills that great managers draw upon in their work.